Not to be confused with Up & Over. Up and Over (or World 1-1) is the first level of World 1 and the first level overall in Super Mario Run. The level starts with a Super Mushroom. After that, the player can see an arrow block pointing right, which spawns four coins, and the player can see a Goomba and the first Pink Coin. To collect it, the player must do a high jump. Afterwards, there is a Warp Pipe and a ? Block, with the block having a Coin in it. After them, three Goombas appear alongside two Brick Blocks, four ? Blocks, and the second Pink Coin. The player must jump over the blocks to get it. After that there are two ? Blocks, one of them has a Coin and the other one has a Mushroom. There's an arrow block pointing ↗, followed by a Koopa Troopa and the third Pink Coin, then three pipes and the fourth Pink Coin. The player must do a high jump on the third pipe to get it. After that there are two ? Blocks, but one of them is out of reach for the player, and three Goombas as well as a Warp Pipe. After that, there are five Goombas in a row and the fifth and final Pink Coin. The player must do a high jump when jumping on fifth Goomba to get it. There is also a Koopa Troopa and two Semi-Solid Platforms before the player gets to the Goal Pole. The level starts with a Super Mushroom. After that, the player can see an arrow block in the air pointing ↘, which spawns four coins, and the player can see a Goomba and the first Purple Coin. To collect the Purple Coin, the player must jump from the Goomba. Afterward, there are a Warp Pipe and a ? Block, with the block having a Coin in it. After them, three Goombas appear alongside five Brick Blocks, three ? Blocks, and the second Purple Coin. The player must perform a high jump over the blocks to get the Purple Coin. After that there are two ? Blocks, one of them has a Coin and the other one has a Mushroom. There's an arrow block pointing ↗, followed by a group of Goombas and the third Purple Coin in a pit, then three pipes. After that there are a Goomba, two ? Blocks, and the fourth Purple Coin, which the player must perform a high jump to collect. After going past three Goombas, Mario arrives at a stack of two Semi-Solid Platforms with Goombas on them, with the second one having a Brick Block above it. The player must reach the second Semi-Solid Platform and hit the Brick Block to collect the fifth and last Purple Coin. There is also a Koopa Troopa and two Semi-Solid Platforms before the player gets to the Goal Pole. The level starts with a Super Mushroom. The first Black Coin is located next to a mid-air wall near the beginning. The player must wall-jump off of it to obtain the Black Coin. After a Goomba, a pipe, and three Goombas, the second Black coin will be on a Cloud Platform with two other Coins. Jump on top of the two ? 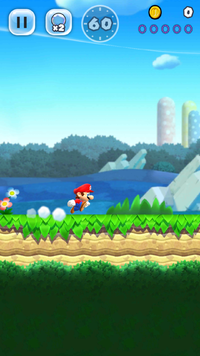 Blocks underneath, then jump and Spin-Jump (if the player is playing as Yoshi, Flutter-Jump) to obtain the Black Coin. The third is in a pit much similar to its Purple counterpart. Jump and slide down the right wall to get it, then quickly wall-jump out of the pit. The fourth Black Coin is located on another Cloud Platform. Jump onto the ? Block underneath, and quickly wall-jump to the coin. If playing as Yoshi, Flutter-Jumping will make this process infinitely easier. Near the end of the course, there will be two Brick Blocks with a ? Block in between them. The player should break the left Brick Block to obtain the fifth and final Black Coin. When there is a Gold Goomba event, the Gold Goomba will be after the mid-air wall near the beginning. Tiàoyuè! Pāndēng! Fānyuè! Jump! Climb! Cross! This page was last edited on February 27, 2019, at 06:10.